Whilst I love Lee's style and like the clothes he wears, he does tend to stick with the same style clothes and will rarely try or wear clothes that differ from his reliable style. Even though I like the clothes he wears and find his style attractive there are at times where I wish he would step out of his bubble and try a different fashion style. Often I have admired a t-shirt or pair of trousers and thought that Lee would look amazing in them but if they do not fit in with his reliable style he has been reluctant to even try them on. As he is a little obsessive about sticking with his style – his motto being if it ain’t broke don’t fix it – and does not like change when House of Fraser recently asked me how I would dress him for the day I thought at least I can virtually give him a make-over. Completely outside of his comfort zone of clothing but something I think he would rock is a biker style jacket. The waxed style, denim biker jacket with lovely detailing by Superdry is top of my list of clothing if I was able to dress Lee in a new outfit. Whilst Lee loves his jeans his style is commonly loose fitting, light wash blue jeans. To take Lee out of his fashion comfort zone I would love to try him in some dark wash skinny jeans. 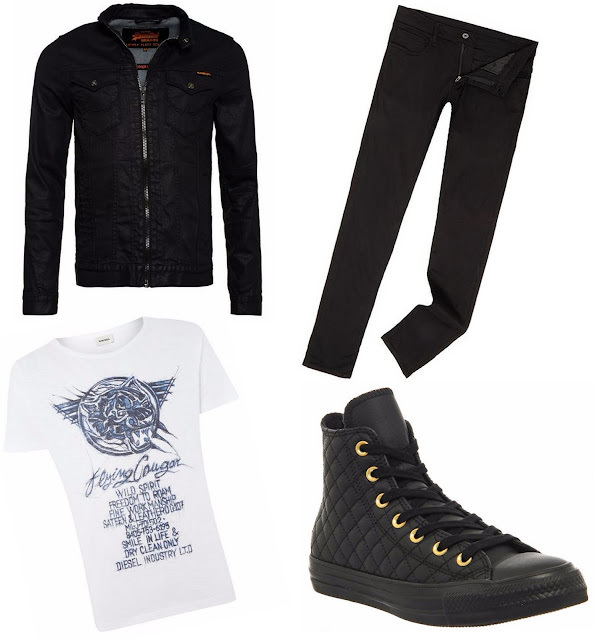 As Lee has lovely legs I think he would amazing in these G-Star 3301 Super Slim Deconstructed Superstretch Jeans. I would love to pair the dark skinny jeans with a bright whitet-shirt from House of Fraser with eye-catching print design. Over the years Lee has often commented that he likes hi-top trainers but as of yet he has not tried any, simply sticking with his traditional sporty trainers. As such I would love to complete his new outfit with a pair of classic hi-top All Star Converse. How would you dress your other half?